Last week Basic Attention Token (BAT) was announced available for trading on Coinbase Pro. This led to a healthy expansion of the price. This week, the announcement came out that now it was available on Coinbase.com and the mobile apps. The result? Everyone seems to have sold the news. - Listed recently on Coinbase.com. - Currently hovering on support from the 4 hour 100MA. - If support holds we will likely retest $0.29-$0.30. - If it fails we will almost certainly fall to at least $0.26. 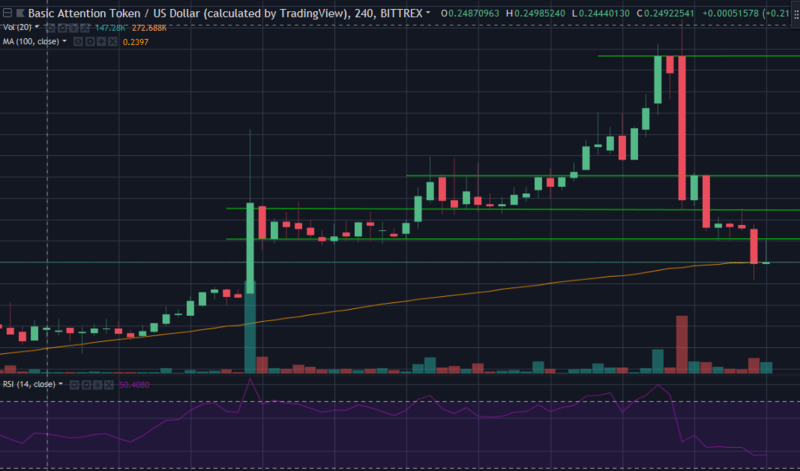 The 4 hour chart for BAT shows us that after further falling with the market today, we have found support thanks to the 4hr 100 MA. This is holding the price between $0.27 and $0.28, below key resistance at $0.29 and support at about $0.26. On the 1 hour we can see a trend reversal hammer formed a few hours ago and is now showing confirmation of a shift. Bull Scenario: We hold here at the 4hr 100MA and find the support to test back up to about $0.30. If we pass that there's more at $0.32, but after that we could run up to the highs before the announcement. Bear Scenario: We break back down, or get rejected at $0.30, and tumble to probably about $0.26. There's significant support there so lower is unlikely, though possible. Overall, BAT will likely do well in the long run being on Coinbase. A combination of selling the news and a general market downturn have hurt it, but both are likely just temporary. Keep in mind this is all the opinion of David Borman and not investment or trading advice. As always, do your own research, make your own decisions. All charts provided by TradingView.